These fish are not normally eaten and most people in India will simply kill them or release them back into the waters. They are considered a nuisance by many other anglers though treat them as trophy fish for their amazing size. If you have any additional information about the Goonch Catfish please leave us a comment below. That's what they get for throwing burned corpses in the water! What do they expect is gonna happen? Of course the fish is going to develop a taste for WHATEVER is in its environment! 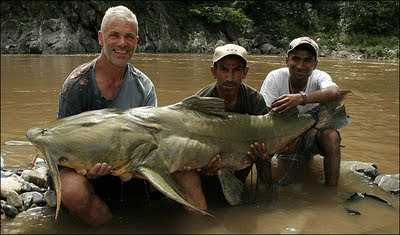 I think the goonch catfish is very intresting and I also love to watch river monsters!